Which island of French Polynesia would be your private paradise? Tahiti, also known as French Polynesia, is a Top Ten luxury travel destination. It is a legend in upscale travel, a place you must go. Tahiti is so tranquil and romantic that over half its visitors are honeymoon couples. This French-speaking nation is made up of 130 islands. About 20 of them are outfitted for tourism, with regular flights and/or ferries, hotels, restaurants, shops, and things to do. International travelers to French Polynesia fly into the main island of Tahiti, usually via Air Tahiti Nui, which runs nonstop flights from LAX. Some visitors stay on Tahiti, which is the most urbanized of all the islands. But most spend one or two nights on Tahiti and then journey to other, quieter islands. All of Tahiti's islands share French Polynesia's laid-back attitude, lush beauty, and aquamarine waters. Staying in an overwater bungalow in Tahiti is heaven. These are Tahiti's signature hotel accommodations, and as private and indulgent as they sound. These thatched cottages joined by boardwalks, and built right atop the lagoon, with ladders leading right into the turquoise-hued, chest-deep water, and boardwalks linking the bungalows and leading to the hotel facilities on the adjoining island. Each of Tahiti's islands has its own personality. See which one sings its siren song for you. Tahiti is French Polynesia's main island and the home of the country's lively capital, Papeete. Resorts on Tahiti island are set on the shoreline outside of Papeete, but most are a cab ride away. This tropical metropolis offers nightlife, restaurants, and museums. =Papeete'sr municipal market is a must-visit offering one-stop shopping for your Tahiti souvenirs: gardenia-scented monoi beauty oil, Tahitian vanilla pods, shell and wood handicrafts, and inexpensive Tahitian black pearls. (Jewelry shops specializing in higher-priced pearls are clustered nearby). Read more about Papeete on Tahiti island. Moorea, French Polynesia's easy-to-get-to resort island, is visible from Papeete, and you get there on a half-hour ferry ride. But Moorea's clocks are set to sleepy island time. Admire the view and selfie your head off at the Belvedere lookout point, which showcases the famous Bali Hai mountain. Moorea visitors can stay at a number of luxury resorts such as Sofitel Ia Ora Moorea. Bora Bora js French Polynesia's most romantic island, It inhabits a dream landscape: luscious beaches, a turquoise lagoon, and jungle-carpeted hills, all lorded over by volcanic peaks. Calling King Kong! Bora Bora offers a dozen serene luxury resorts including Four Seasons Resort Bora Bora, known for heavenly honeymoons; St. Regis Bora Bora Resort, with a culinary focus; and Bora Bora Pearl Resort. Taha'a, French Polynesia's "Vanilla Island," is home to vanilla plantations that perfume the entire island with their soft spice. The island also houses French Polynesia's only Relais & Châteaux resort, Le Taha'a Private Island Resort and Spa. A few minutes' walk (or wade) from Le Taha'a is one of the world's most celebrated snorkeling sites, the Coral Garden, a narrow channel whose current pulls you over a jungle of spectacular neon-hued coral formations. Several other barely-developed islands are visited by day-trippers staying on Tahiti's bigger islands. Rangiroa is not precisely an island, but the world's next-to-longest coral atoll, a necklace of 240 motus, or mini-islands Result: Rangiroa is a trophy destination for diving, snorkeling, or finding your beach bliss. Accommodations here tend toward quiet guesthouses. Bulge-shaped Huahine ("pregnant woman" in Polynesian) is noted for French Polynesia's best-preserved stone marae, tribal ceremonial platforms. Nowadays, islanders worship in red-spired white churches, but they still fish in ingenious, dam-like traps made by their ancestors. Huahine hotels tend toward small, simple, family-owned hotels. Airport-equipped Raiatea has a rocky shoreline light on beaches. This enterprising isle has become French Polynesia's nautical capital, where private yachts dock. (Quite a few can be chartered, complete with crew and cook.) Raiatea features paved roads for bike and scooter rentals, a dockside open-air mall for browsing, and pearl farms to visit. Raiatea's pearl boutiques, owned by island pearl farmers, delight comparison shoppers. French Polynesia's Marquesas Islands are the most remote islands on Earth. A three-hour flight from Papeete, they are visited mainly by cruise passengers on small cruise ships. The fifteen rugged Marquesas Islands rise dramatically from the Pacific in rock cliffs, shrouded by mist that turns lilac at dawn and dusk. Strapping Marquesan islanders are descended from fierce warriors and are proud of their culture. They have revived traditional arts like spear-carving, tattooing, and raising native black pigs and Marquesan horses. Marquesan guest accommodations include two Pearl Lodge hotels and numerous family-owned inns. 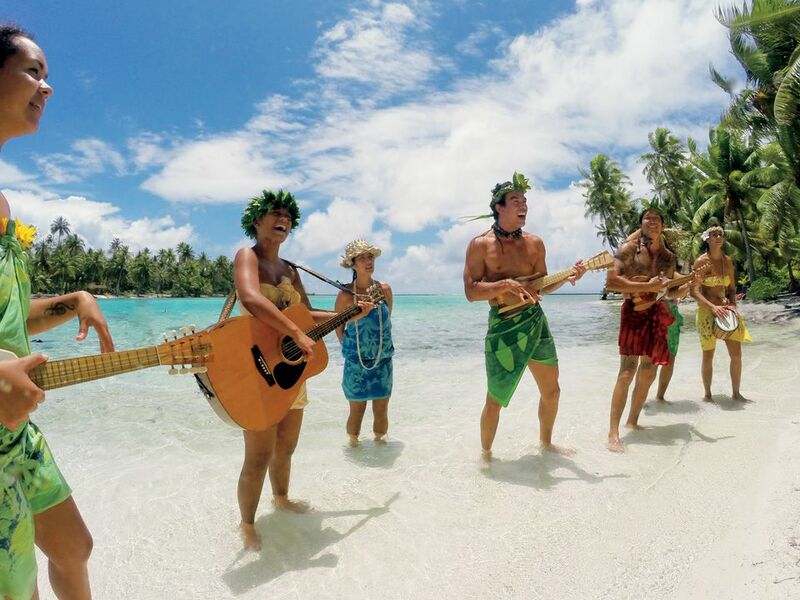 Set a short flight from Tahiti, Tetiaroa is a semi-private island put on the tourism map by Marlon Brando, who filmed the 1961 classic, Mutiny on the Bounty, here. Brando fell in love with one of the Tahitian actresses and with Tahiti, and bought the island. He opened a hotel that was fashionable for a couple of years. A new resort called The Brando opened in 2015 with 35 overwater bungalows and all-inclusive pricing. Tetiaroa's prior history is equally interesting. It was owned, like most islands, by the Tahitian royal family. In the late 1800s, the king gave the island to the family's Scottish dentist instead of paying his bill. Today, all of Tetiaroa is a wildlife sanctuary open only to day-trippers and to guests of The Brando. To help you chose your dream island in French Polynesia, check out the Visit Tahiti website.